The only Amish settlement in the USA located on a Native American reservation. This is a New Order community and unlike others they do worship in a church building as opposed to homes. Bicycles are used frequently by the Amish here and are handy for traveling the flatness of the valley. Two church districts spread out along the base of the Mission Mountains and, interestingly, this is the only Amish community in the USA located on tribal lands. 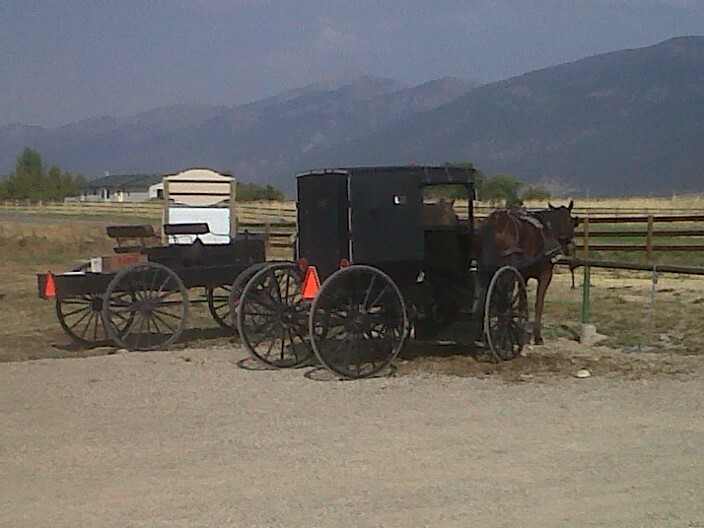 The Amish settlement is on the Flathead Indian Reservation, more formally known as the Confederated Salish and Kootenai Tribes of the Flathead Nation. I will have more to say in a future post about the state of Amish and Native relations. There has been some friction. The first thing that strikes a visitor to the St. Ignatius settlement is the beauty. Stunning vistas of the Mission Mountains are a constant. Most of the Amish homes are wedged right up against the base of the mountains which rise dramatically from the valley floor. Many of the Amish of St. Ignatius have deep family ties back in Ohio, so these Amish will hop onto commercial flights and travel. Most Amish churches do not permit air travel. Food in this settlement ranges from traditional to local, with wild game from the mountains and fresh huckleberries being found on menus frequently. The hub of the settlement, especially for visitors and tourists, is the Mission General Store. The store is quite similar to Amish bulk food stores out east. The store is “a jungle of a store with a country attitude,” says owner Delbert Bontrager. He opened the place in 2003, and it i stocked with unusual and sometimes random items. Occasionally a local Amish baker will sell cinnamon rolls, homemade deliciousness, from a table on the front porch.